When I lived in Japan I used to see Indians almost every day, just about every day. They were practically everywhere, at least in Tokyo and its surrounds, where I spent most of my time: teaching English, running supermarkets, working in IT; you'd see couples or whole families strolling under parasols through wet Myoden (妙典) on the way to the recycled clothes store at Gyotoku (行徳), or jogging on the concrete banks of the Arakawa River (荒川) in Hirai (平井), or jostling along with the rest of human tide in Shinjuku (新宿) where Indian and Pakistani and Bangladeshi restaurants always did a good trade, and Indian food was popular, perennially. I probably noticed them more because I happened to live in Shinozaki in the Edogawa Ward of Tokyo, which was (and still is) renowned for being one of the centers of the Indian diaspora in Japan. There was an Indian kindergarten/preschool/elementary school/high school just down the road from my old place, near Mizue Station in South Shinozaki. There were plenty of Indians on the train, the Toei Shinjuku Line train. For some reason the Indians tended to congregate in the first carriage, it had become a local tradition. According to statistics there were 22,000 Indians living in Japan in 2010, but there actually seemed to be a lot more. That might because as a foreigner I tended to notice other foreigners easily, and Indians stuck out from the crowd just as much as I did. 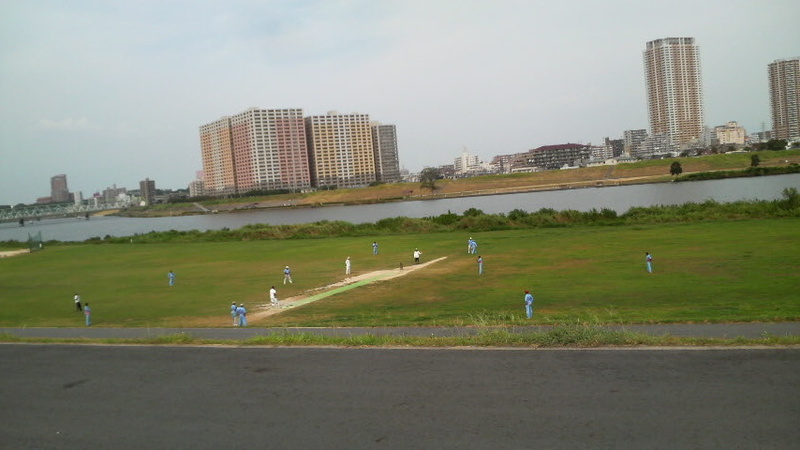 Indian cricket game on the bank of the Edogawa River, facing Ichikawa City, surrounded by baseball fields. Being a nomad myself, I am always interested to meet fellow wayfarers in strange parts of the world, and understand what motivated them to leave the safety and security of home. I also have an interest in ethnic enclaves in general, like the eccentric Ethiopian congregation on the roof of the Church of the Holy Sepulchre in Jerusalem, or the Icelandic/Scandinavian towns on the North American plains. About five years ago (late 2007) I was invited to dinner by Umesh my old Nepali friend in Koenji in west Tokyo, and in the process, I got a glimpse of just how the subcontinental community in Japan lives. 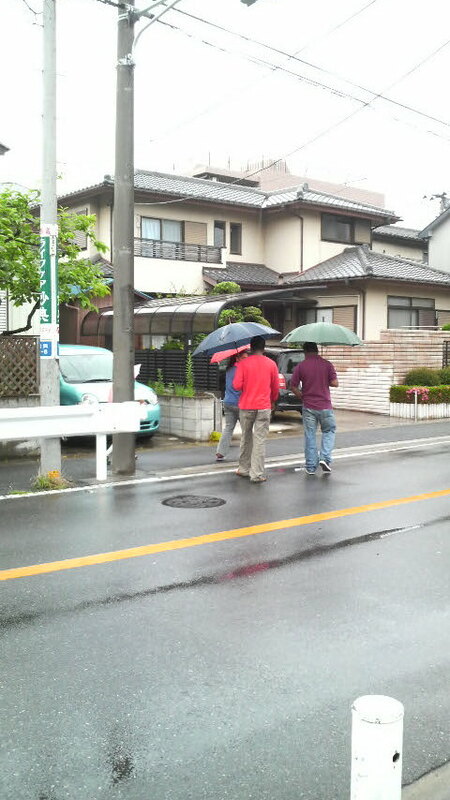 Like my own neighborhood in Shinozaki, Koenji has become a magnet in recent years to guest workers and opportunists from the subcontinent: Umesh said his ageing apartment building was owned by a Pakistani. His next-door neighbor was an Indian, and the cold concrete passageway outside the house was more than tinged with the scent of curry. What proved interesting to me, as I dined with Umesh and his wife, was the education into how modern Diasporics use new technology to connect with each other and entertain themselves in their adopted countries. In short: I never used to be much of an Indian movie fan, but if I spend more time at Umesh's house in the concrete heights of Koenji, I will become one. Myoden, a quiet suburban region near Urayasu in Chiba Prefecture, boasts a large Indian community, as well as an Indian kindergarten. PAL Arcade in Koenji, the heart of Tokyo's "Little India". We had no audio, but you didn't need ears to hear the taunts which must have belched from the stands at the Sydney Cricket Ground every time an Indian tail-enders put bat on ball, and darted up to the other end of the wicket. You could feel the tension in the air, as the old cliche goes, even this far away, in wintry Japan... the atmosphere was boiling over. At home in Australia, I could well imagine my Dad cursing at the TV and perhaps even launching the remote-con at the screen, once it dawned on him that India might have a chance of winning. But then Sharma was bowled out by Lee, and everything was golden again, Down Under. Rapturous cheers, and grinning commentators delivering their post-mortems. It was a vivid moment which proved to me that sometimes imagination outclasses technology; and the nearest memory it evoked, was listening to the action at Lords on shortwave radio, when I was about eight-years-old and living on the NSW Central Coast. Those were the days when books had better special effects, than the Hollywood recreations of them (I am thinking in particular of JRR Tolkien's The Lord of the Rings, or Baz Lurhmann's The Great Gatsby). The following night, at my singing job in Shinjuku, I related the story to my Kiwi coworker D. "It is a pity there is nowhere on the Internet you can watch the cricket live," I remarked. "But there is," D. said. "Why don't you try Sopcast? There is some Indian guy running it, feeding cable TV live on to the Net." One of the first places I visited in Japan was Shibuya (渋谷), the jubilant youth fashion quarter south of Shinjuku, on the prosperous west side of Tokyo. The date was November 11 2000, my first ever morning in Japan! The sun was shining, the crows were cawing: it was textbook Tokyo to a treat. Unfortunately, my baggage had been lost in transit, and was sitting on a carousel at the airport in Singapore. I was dressed only in my Australian jeans and a T-shirt, and the cold Japanese winter was coming on. I needed to buy a winter coat -- and cheaply! Fortunately, Shibuya saved me. That's the great thing about it, it is a Mecca for recycled clothing. I never expected it would be like this, until I took my first stroll through the narrow winding streets here, looking for a place to stay. I thought Japanese hated old stuff, and were obsessed with the shiny and new. Certainly, the architecture accumulated around Shibuya's sprawling railway station seemed futuristic to a fault, that morning in November 2000: needle-thin buildings, some hung with huge TV screens or posters of J-Pop stars, and ads for the latest Beatles anthology. That was the kind of Japan I was expecting and it was all there, in overload. Brand name department stores and bling, check. Fast, brightly colorful passenger trains whizzing by overhead, you bet. Hypermanic salespeople spruiking the crowds with their megaphones and cupped hands, sure. But second hand clothes stores? Who would have thought that? There were tonnes of them, especially on the road which links Shibuya to Yoyogi Park, which I trudged up looking for lodgings. I couldn't find anywhere to stay, but I shortly discovered a preloved jacket, in a bitching industrial style! According to the must see website: "Shibuya leads Japan in popularity, constantly creating new culture in the worlds of fashion, food, and music. Fashion trends that start here always draw the attention of young people and they quickly spread throughout Tokyo and then the rest of the country. Sometime between the late 80's and early 90's, Shibuya started to attract public attention as a fashion town. Shibuya, subsequently became more entrenched as the definitive spot for Tokyo's youth. With the boom in brand awareness and the economic boost of the Bubble Economy, PARCO and Marui enjoyed several prosperous years in that era. After Shibuya reached its peak as a trend-setting neighborhood, the town quickly fell back during the economic strife of the late 90's. Though the unusual fashion and makeup among teenage girls captured public attention again during the late 90's, it was in vogue for a very short time." However, while the economy has slumped, recycled fashions have risen to a new prominence. When funds run low, you turn to budget alternatives. And I believe this is one reason why Japan today is caught in a recycled clothing epidemic. Japan is turning to cheaper alternatives -- this is a good thing, a vagabondist thing. To me, nothing seems so vagabondist as the recycling of clothes and other essential items. It is the ultimate in vagabondism, and Japan is now patently a vagabondist country -- I realised that as soon as I stepped off the plane. I was expecting it to be a Bubble economy, but thankfully it turned out to be postBubble. It was (and still is) a glimpse of life after the Baudrillardian implosion, for those Westerners saddled with their fantasies of endless growth. Young people in Japan understand that while the conveyor belts of production are now dragging to a halt, there are nonetheless vast mountains of goods lying around all over the world, some of them in their original wrappers, waiting to be (un/dis)covered. Just don't call these gems "second hand", or even recycled... they're vintage! Japanese might be budget conscious, but they still have class. 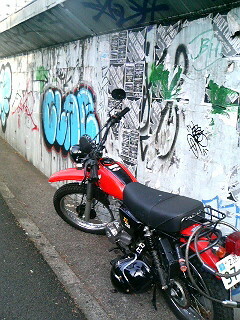 Even when they're grungy, Japanese are styling! For the next 10 years, I used to go shopping in Shibuya a lot. Eventually I got sick of it, and started looking for fresh pastures, out in the suburbs where tourists rarely tread. When foreign friends and relatives came to visit, however, they always insisted on meeting in Shibuya, and seeing that globally renowned Tokyo street style. I made sure to show them some of the recycled clothes stores in the neighborhood too, and my guests were always impressed. There are two choices when it comes to buying used clothes in Tokyo: flea markets or clothing shops. Make that three choices if you count the street stalls that crop up on sunny days. A visit to the Sunday flea market on the roof of the Tokyu Store, across from the East Exit of Shibuya Station, gives a glimpse into the future of clothes recycling in Japan. Most of the buyers and sellers are school kids in their early teens, who pour out of the rooftop elevator at 10 A.M. lugging big sacks of clothes to sell to each other. The limited roof space fills up quickly with shoppers sifting through clothes, shoes, a few electronic goods and the occasional box of used CDs or tapes. By 11 A.M. the place is crammed, but you can usually decide whether a vendor's clothes are worth working your way toward by looking at what he or she is wearing. If the vendor goes for the massive-street-pants-and-oversized-shirt look, and you don't, try another direction. Prices vary, but they tend to be low. Jeans that sell for 7,000 yen ($84) or more at the established Shibuya department stores can be found in nearly the same condition for 1,000 yen or less. 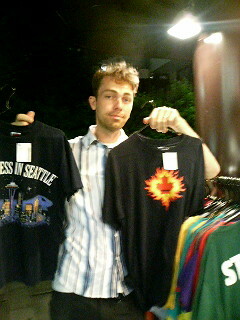 T-shirts are another popular item that can be bought for around 500 yen. Point out imaginary flaws and demand a discount if you want: Bargaining is considered all part of the fun. Cat Street, 6-14-7 Jingumae, Shibuya Ward, Tokyo. The craze for vintage clothing has been hitting some fashion retailers pretty hard, especially those whose business is street casual wear. Few brands are as prized as adidas when it comes to vintage, and the guys at head office have come up with a scheme to cash in on the cachet of the company's illustrious history: adidas Originals. Opened on Cat Street last month, the store is laid out much like a flea market with low trestle tables and haphazard stacks of cardboard boxes. The stock consists chiefly of remakes of classic adidas items from 1972-1996, allowing shoppers to get the retro look without having to traipse around swap meets or trawl through vintage stores. You may need to wear in the 83-C training top and 1976 Stan Smiths yourself, but at least the smells and stains will be your own. Some newly designed items on offer include the affordable Levi's collaboration denim sneakers and not-so-affordable Swarovski collaboration, a rhinestone-encrusted fantasy shoe available only in this store. The shack is open from 11am-8pm daily. On the way to the Olympic Stadium and Yoyogi Park, if you are heading from Shibuya. Despite what the name implies, they don't sell surfboards here, but rather recycled surfwear like T-shirts and sh!t. Billabong and the House of Town & Country and all that jazz. I didn't see any bikinis inside either, so don't go looking for them. Placing your trust in Japanese-English names and signs will always disappoint you. I can almost imagine when the guys who opened this store were trying to think of a name, they decided just to slam together all the surf-related English words that they knew. "What surf words do we know? -- bikini... surfboard... hey, let's call the shop Bikini Surfboard!" It would be like if a bunch of Californian guys who spoke no Japanese decided to open a sushi restaurant -- what would they call it? "Sayonara Samurai" or something like that? Or maybe just "Sayonara Sucker"! 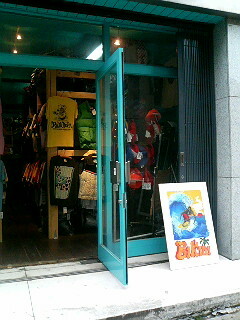 There are of course surf-inspired and Hawaiian stores all over Japan, but this one has a strictly recycled and vintage theme. 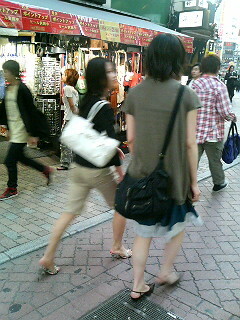 6-31-21 Jingumae, Shibuya Ward, Tokyo. Phone: (03) 3409 5017. Web: http://www.chicago.co.jp/. Variety of vintage goods here: T-shirts, training gear, jeans, hats, coats, kimono, haori, modern clothing made from kimono, much more. Has several stores, mostly in Tokyo. 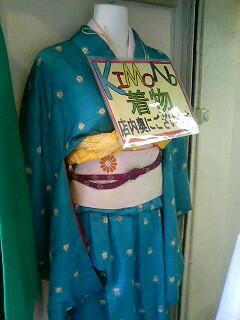 At the Harajuku branch, you can even buy a used kimono! Omotesando Store/Tokyo: 6-31-21 Jingumae Shibuya Tokyo. Phone (03) 3409 5017. Jingumae Store/Tokyo: 4-26-26 Jingumae Shibuya Tokyo. Phone (03) 5414 5107. Shimokitazawa Store/Tokyo: 5-32-5 Daizawa Setagaya Tokyo. Phone (03) 3419 2890. Sapporo Store: 1-3 Nishi Minami 1 Jyou Chuou Sapporo Hokkaido. Phone (011) 219 2202. Fukuoka Store: 1-15-35 Daimyo Chuou Fukuoka. Phone (092) 739 0165. 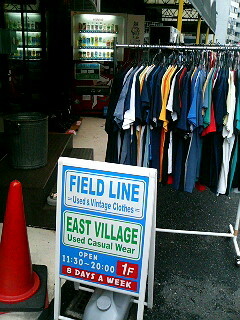 East Village/Field Line: 渋谷区神宮前６-１９-１６第３宇都宮ビル1F . 1st Floor Number 3 Utsunomiya Building, 6-19-16 Jingumae, Shibuya Ward, Tokyo. Last time I waltzed past there was a rack of shirts out the front selling for just 100 Yen... but maybe that was because it was an end of summer sale. Up the road from East Village you can find Mesa, another select used clothing, which boasts badges... tonnes of them. Also plenty of shoes and French hip-hop stuff on the soundsystem, ultracool Japanese staff. E-Z shoe & clothing: 渋谷区神宮前1－12－16和光ビル2AF. 2A Floor Wakkou Building, Jingumae, Shibuya Ward. A small, non-descript shop on the second floor of a building on the big road linking Shibuya and Harajuku, E-Z is packed with West Coast, recycled clothes -- basketball shirts and faded jeans, etc. To be honest this is one of my fave haunts in the Jinguumae area, and it is situated not far from Tower Records, one of the regional landmarks. Plenty of dead stock shoes with an Adidas look, including live actual Adidases. There are rare trainers from countries that don’t even exist any more, such as Yugoslavia and West Germany. Expect to pay between 20,000 Yen and 100,000 Yen for a pair of shoes. Clothes much cheaper... say 2000 Yen to 10,000 Yen for Levis from the 70s or a Tshirt of Bert ＆ Ernie, or something from the Hawaian school of thought. 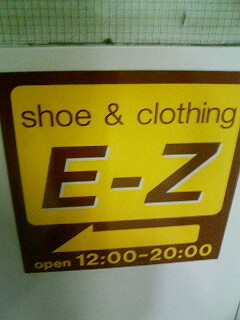 E-Z shoe & clothing is open from 12noon to 8pm daily. 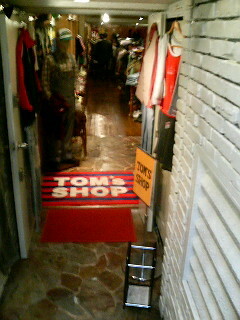 Located in the basement floor of the same building is Tom’s Shop Usa 古着, which is described later in this article. There is no sign on this store and the last time I visited, only a small piece of paper stuck to the door acknowledged its name: Flamingo Saloon. Then again, it might be called Pink Flamingo，I am not quite sure. At the very least there are two stores connected to each other (same owner perhaps, part of a chain) -- Pink Flamingo and Flamingo Saloon -- and you can find one of them in Shibuya, along the road at Jinguumae from Shibuya to Harajuku. This is basically another Shibuya style vintage clothes store with a street front. Phone is (03) 3477 7376 for the Flamingo Saloon and (03) 5489 4440 for the Pink Flamingo. By the way, if you are interested in the world of Japanese city fashion, you should click this link -- it's an online Japanese fashion magazine, and it contains a list of clothes stores in Tokyo. They have an article inside called People Like A Used Clothing, with a model shot on location in such picturesque locations as Yoyogi Park. 1st Floor Dainesu Ichiban Jinankan, 1-11-5 Shibuya Ward, Tokyo. In the same building as another classic clothes store celebrating the spirit of California, Santa Monica, and adjacent to the wellknown guitar shop, Acoustic Design. 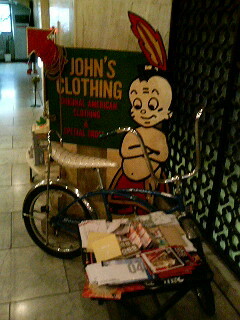 This looks like a funky little number, but it is one of only many recycled/classic clothes stores in this part of town. Why do they call it John's Clothing? I am sure that this being Japan, the owner's name is probably something like Hiroshi or Koji or something like that. Anything but John. Perhaps they called this shop "John's Clothing" because John is the stereotypical name of the Westerner -- the Anglo-American-Australian who would normally be wearing these kinds of clothes. Nonetheless, the shop is cool, so you better check it out. 1st floor 0 Building, 1-9-2 Jinnan, Shibuya Ward, Tokyo. You can find a lot of neat stuff in Shibuya... there is a whole hilly hiphop district and a big mall devoted solely to Harley Davidson apparel. The classic clothes district of Shibuya is not half as glamorous as the hip hop district, but perhaps that is in keeping with the laidback attitudes of the genre. In the middle of the district I found a store called More Budget ESP -- whether it is still there with the same name when you visit is an open question. 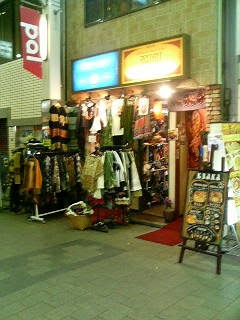 Interestingly, More Budget is not really a classic clothes shop at all... but rather a hip hop/Reggae influenced boutique. If like me you like Reggae you will also like this shop. There are plenty of fliers on display giving you a good introduction to the Japanese Reggae scene. For example I picked up a leaflet advertising a Reggae Dancehall night called Rocker's Paradise at Shibuya Club Camelot (every 2nd Wednesday ++ next show on 07/02/14 featuring Burn Down from Osaka, Super-G and Gladiator with sound system + 2500 Yen plus ID to get in the door.) Apart from Shibuya Club Camelot, the long running Club Asia is another good place to catch Reggae and hiphop events. Also check out Club Unity. If you need to buy Reggae records in Shibuya, go to Homebass Records, duel, or Rocker's Island. 1st floor Harajuku Quest Building, 1－13－4 Jingumae, Shibuya Ward, Tokyo. Bitter rivals of adidas for 54 years, having been established by Adolf Dassler's disgruntled brother Rudi, Puma is still battling it out with the three stripes for dominance of the retro sneaker market. Puma's latest move in the war is the unveiling of the world's second Puma concept store (the first is in Santa Monica, Calif.) late last year in Harajuku. As might be expected from a concept store, this one boasts a smart, clean interior and is sparsely stocked with high-end Puma products. The Italian-designed revival line, Platinum Collection, is the mainstay of this sneaker freak's paradise, but specially selected accessories, bags and clothes from other lines do make their way into the store. If you need to get kitted out for the gym, get down to Kanda, where "concept" means high-brow, high-fashion, high prices. Those who care about what message their footwear communicates won't want to miss the hot releases due in store this season. With the resounding success of the Puma/Sparco boxing boots behind them, more dual name sneakers are in the cards, including a new Jil Sander design. This store is the only place to be seen buying that dinky gym bag, a styling T-shirt or a good ol' pair of Clydes. The joint is open from 11am to 8pm. 3-24-7 Jingumae, Shibuya Ward, Tokyo. According to the once informative, international (and now deceased) w-guides site, Ray Beams Remodeled "stocks customized secondhand and old clothing. However, unlike many other "recycle" stores, Ray Beams attempts to keep the loud "hippie" chic style away from its products. Instead, simple more neutral designs are made up from a mixture of old and new materials. The result is a more casual and comfortable range of clothing. The knitwear is particularly good and there are still some more eccentric items in the form of hand-painted and sequined T-shirts. There will soon be a range of imported recycle products from LA." The nearest train stops at Meijijingumae Station, and the shop is open from 11am-8pm daily. 1-11-5 Jinnan, Shibuya Ward, Tokyo -- a few doors down from Tower Records, that great futuristic yellow building. 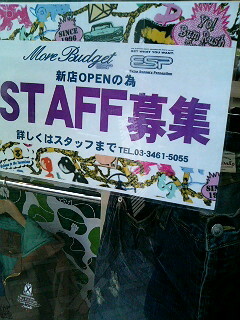 The Harajuku store for this chain is at 5-18-8 Jingumae, Shibuya-ku (phone: (03) 5468 3133). The Kichijouji store for those out further west is in the Keyaki Building 3F 1-1-8 Minami-Chou, Kichijouji, Musashino-shi (phone: (0422) 487 926). 4th floor San Forest Building, Jingumae, Shibuya Ward, Tokyo. It is a steamy Sunday afternoon in August, and the streets of Shibuya are jammed with the usual packs of misfits. 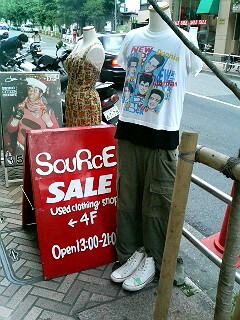 I stopped at a used clothes shop called Source. It is at the far end of Shibuya (actually Jingumae) near Shibuya Fire Station. In the Sun Forest Morita Building, on the 4th floor. There is the usual array of classic items for guys and girls... about 5000 yen for most stuff. It seems more girl friendly than other shops discussed on this page. On the other hand, there is nothing in this shop special or outstanding enough to justify climbing those four flights of stairs up there (there is a lift, but still, you have to stand around waiting for it to come), and the place is so small, you could probably skip it. In this part of town there is a used clothes store every 20 metres or so, so move on folks and find a better shop! As the sign says, open from 1pm to 9pm. Basement floor Wakkou Building, Jinguumae, Shibuya Ward. This place used to be on the 5th floor of the 和光 building, but as of late March 2006, could be found on the more accessible basement floor. It is similar to the E-Z shoes & clothes outlet up on the 2nd floor, although the shoes are cheaper (under 5000 Yen as far as I could see.) Apart from that, there is the usual selection of vintage wear, at pretty good prices. Open 12noon to 9pm. Across the road from ABC Mart. Iberia Biru 1F & 2F, 6-5-3 Jingumae, Shibuya, Tokyo. Variety vintage. T-shirts, jeans, shirts, hats, coats, you name it. Large chain with stores all over Japan. Open 10am to 9pm. Cafe Vườn Kiểng is one of my favorite cafes/bars in Ho Chi Minh City, although it is kind of tedious to reach (if you come on foot, be prepared to dodge the trucks crossing the road here, Tôn Đức Thắng Street almost exactly opposite Mê Linh Square with its statue of General Trần Hưng Đạo). If you make it here alive, however, you might be tempted to stay here for the rest of the day. 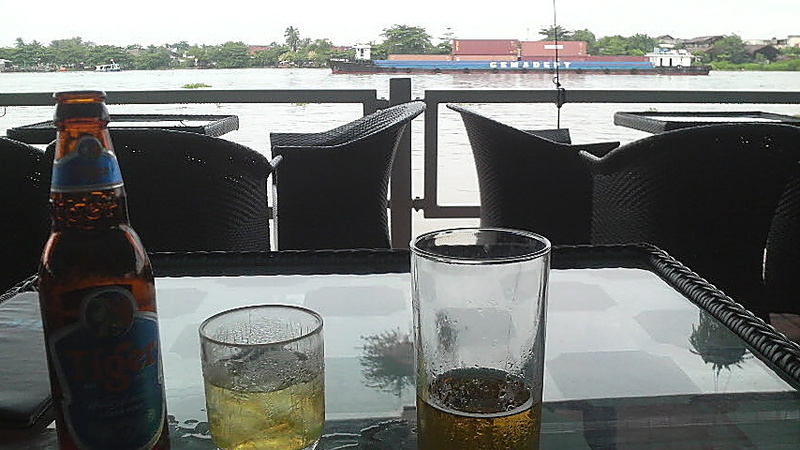 The cafe sits right on the banks of the Saigon River, and boasts relaxing views and plenty of refreshing breezes. On the brown waters of the river an endless procession of craft passes, usually sluggishly: there are container ships, barges carrying garbage or tonnes of soil, junks bound to the Mekong Delta or filled to the brim with diners, and ferries, many ferries, some of them designed like monsters. Opposite the cafe lies all green and tropical the Thủ Thiêm island, which survives as a bastion of rural Vietnam in the heart of the city. Remarkably, as of 2010 when I was there last there was no bridge linking Thủ Thiêm with downtown, so traffic had to queue cattlestyle before being ferried across the river. Two ferries seemed to work on the job all day long, and I never grew tired of watching them crisscrossing from jetty to jetty, loaded down with their motorbikes and cars. I just love watching people work when I am on holiday! If you ever look out the window of your plane coming in to land, you will see Ho Chi Minh City is lashed by any number of languidly lolling rivers. These rivers are the lifeblood of the city's trade, but they have also curtailed its development and limited its potential. Thủ Thiêm has been isolated until now (hence its charm), but there are big plans for its future. Check out the island's official homepage for a glimpse of what could be in store. 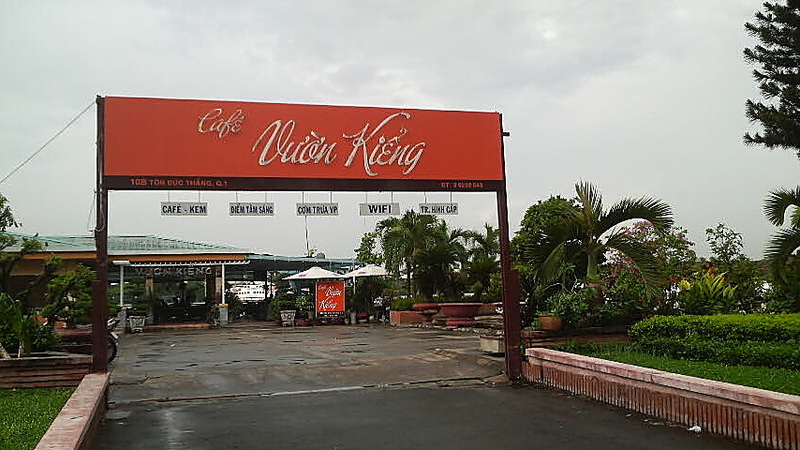 If Thủ Thiêm does indeed become a new metropolis, then Cafe Vườn Kiểng would be ideally situated as a waystation on a hot, humid day. You could park your motorbike in the lot out the front, go in and sink a cold beer on the deck. 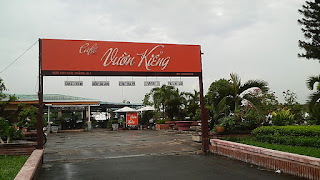 Cafe Vườn Kiểng: 10B Tôn Đức Thắng St, Dist. 1, Ho Chi Minh City, Vietnam. Phone: (08) 290 9410. Why do they give bánh xèo the fiery, explosive name that they do? Noodlepie the lonely food nerd and conqueror of Indochina says: "While the recipe itself might be a piece of piss, getting it right requires a deft hand, a frying pan as hot as the sun and a nibble touch with the batter." As if to echo my aforementioned sogginess fears, Noodlepie carries on: "Bánh xèo pancakes should be crispy on the outside and ever so slightly moist on the inside. Leaving it hanging around too long and you've got a soggy savoury crepe on your hands and you don't want that, believe me..."
I have watched a few videos of bánh xèo being cooked, and it seems the secret to its explosive crispiness lies in the way the chef swiftly swirls the batter around the hot wok. 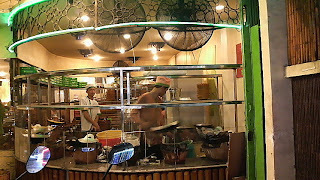 In the photo above you can see a bánh xèo chef at work on his wok, halfway through the swirl. That's how they do it, Saigon street style. In the video below, you can see how the pro's do it at home. To my western eye, they look like Indian samosas. Others have compared them with Cornish pasties. Noodlepie, that connoisseur of Vietnamese street food, says: "You can find this anytime-of-day snack all over town. Mine came served in an ingenious little snack pocket made of crumpled up magazine advertisement pages with a bag of sweet chili dipping sauce. They cost around 5,000VD a throw (US$1 = 15,700VD). 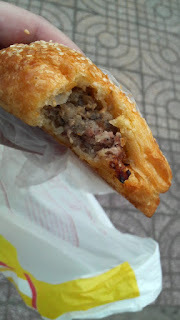 The centre is filled with lightly spiced minced pork and onions. The pastry is fried to a thin crisp giving a satisfying crunchy-munch." The thing in the photo above is not Bánh gối. I don't know what it is called, but maybe it is on the Bánh gối bent. It is in the same basic ballpark, to my western taste buds at least. I bought it from a bread shop across the road from the Cultural Park, near a proper Bánh gối streetstall, the second last time I was in Vietnam, mid 2010. Pikelet and Pie says: "Bánh gối, or pillow cakes, seem to be the curry-less curry puff of Vietnamese cuisine. Deep fried pastry perfection encasing a texturally diverse jumble of glass noodles, minced pork, wood ear mushrooms and thin slices of lap cheong. Crisp, flaky exteriors, flavourful fillings. Dip them in the your self-adjusted sauce and alternate mouthfuls with cold vermicelli noodles and plentiful fresh herbs..."